A rare map is stolen but the thief turns up murdered next to a forged copy. What is on the real map that has people committing murder over it? And who has it? Watch Elementary Online to find out the answers. Watson is back from her trip to Denmark. She notices that Sherlock has Kitty running all sorts of errands and advises Kitty to not always be at Sherlock's beck and call. Sherlock sends Kitty to investigate a robbery at the 39th Street Library. But it turns out more than a rare map was stolen, but a guard was also killed. Sherlock quickly identifies the thief, Stuart Zupko, but when the police go to arrest him, they find him dead. The Bray Map is still there, but Sherlock says it is a forgery. The Bray map is part of a larger atlas, the Smythe's Virginia, which has been sold to an anoymous buyer. Sherlock and Joan go to the law firm that handled the sale and meet with the buyer, Martin Hull, a real estate magnate. He offers to hire them to find the map. Sherlock declines by walking out of the meeting. He knows the real value isn't the map itself, but what's on the map. What information is on the map that is worth two people's lives? Who has the original map? Find out the answers when you watch Elementary Season 3 Episode 6 onlinve via TV Fanatic. 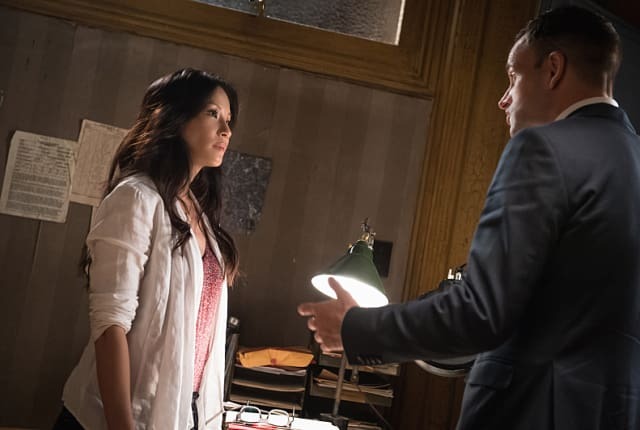 On Elementary Season 3 Episode 6, Holmes and Watson investigate when a stolen rare map leads to murder while Kitty makes some new friends, much to Sherlock's dismay. Joan: So, did he behave himself while I was gone? Kitty: That depends, are you talking about the frowny one with the hard shell or do you mean Clyde? Permalink: That depends, are you talking about the frowny one with the hard shell or do you mean Clyde? Joan: Do you need to take that? Sherlock: No, I don't believe she does. Joan: How would you know? Sherlock: Because we got a lot of work to do and very little time to do it. Joan: I'm here. I can help. Sherlock: And help you shall. Joan: What if my phone rings? Do I need your permission to answer it? Sherlock: You are not my protege. Kitty: Uh. I'd like to go to the loo. Unless either of you have any objections. Permalink: Uh. I'd like to go to the loo. Unless either of you have any objections.